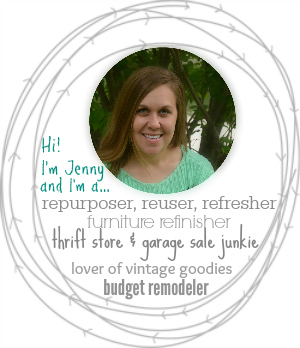 Reusing old wood and glass jars in one project?! 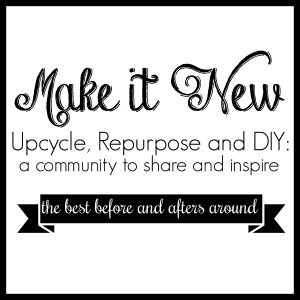 Yeah, I agree, it doesn’t get any better than that to those of us that love to reuse stuff that is otherwise destined for the garbage! I grabbed some old cedar fence pickets from a pile my dad had stashed away in his back yard. Honestly, most of them were in really bad shape, but I pulled a couple out that were still salvageable to be reused. I then found the halfway point on the width of each board and marked it. 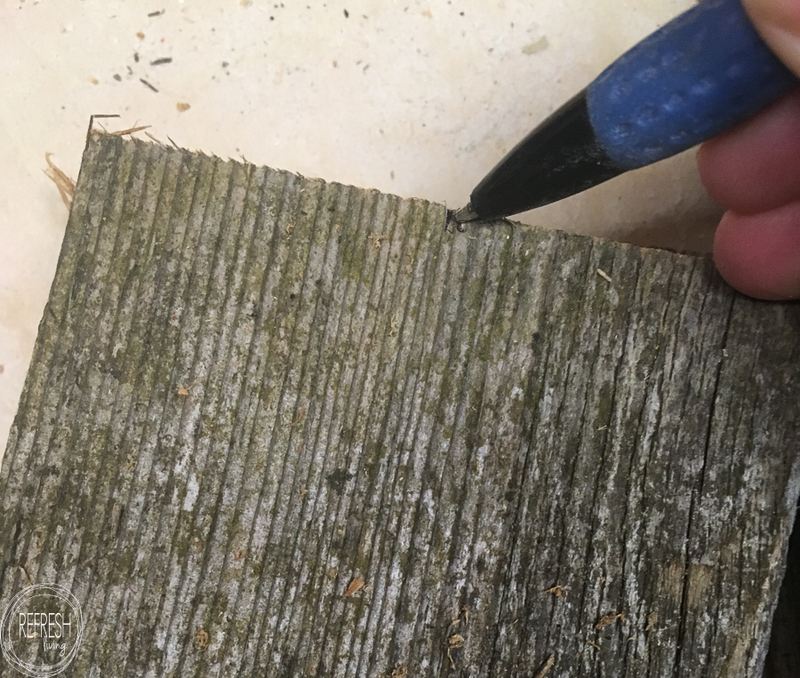 My preferred way to find the halfway point without any math is to take a piece of paper, trim it down to the width of the wood, and then fold it in half. MUCH easier than dividing fractions, that’s for sure! 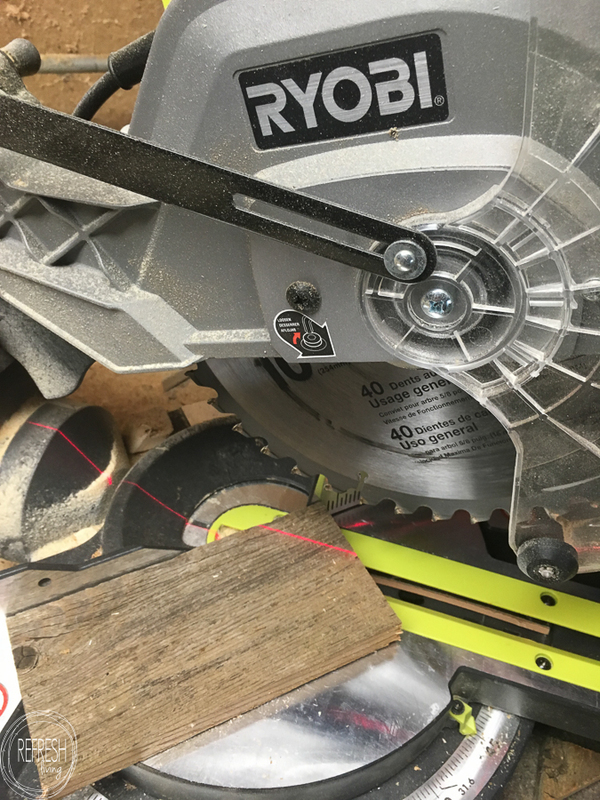 I set my miter saw at a 45 degree angle and made my cut right at that halfway point I marked. 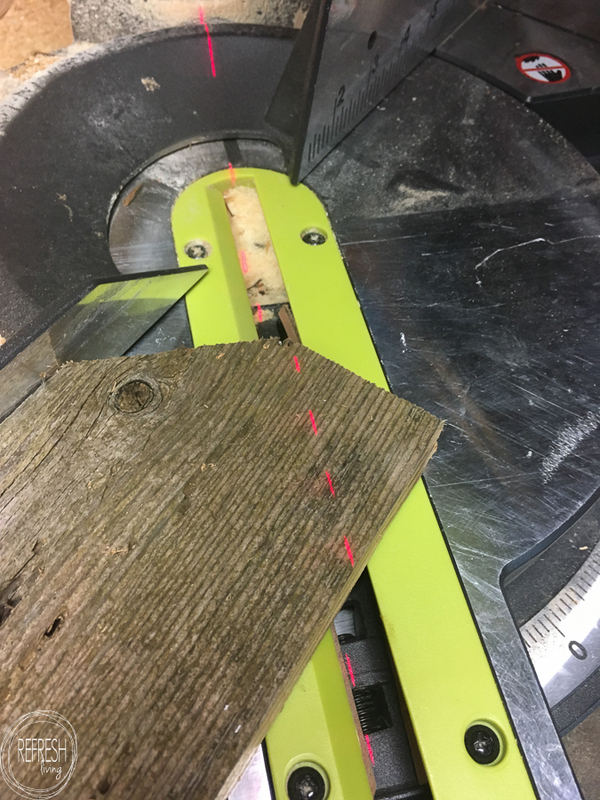 I swung my saw around to the other 45 degree mark and cut the other side. This takes a little bit of practice, but once you get a hang of the width of your saw blade, it’ll work out just fine. It might be worth it to practice on a couple of scrap wood pieces first, though. 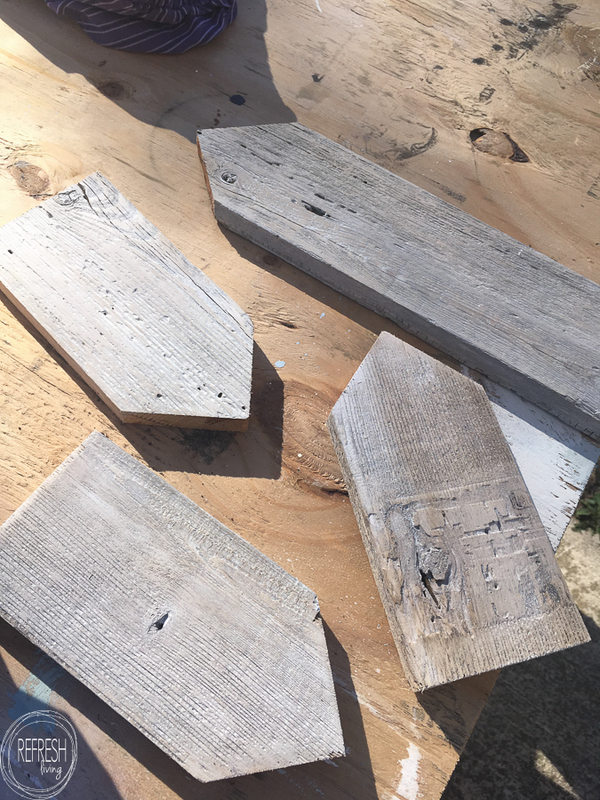 I whitewashed the pieces (using this method for whitewashing wood) to lighten them up and give them a bit more dimension. 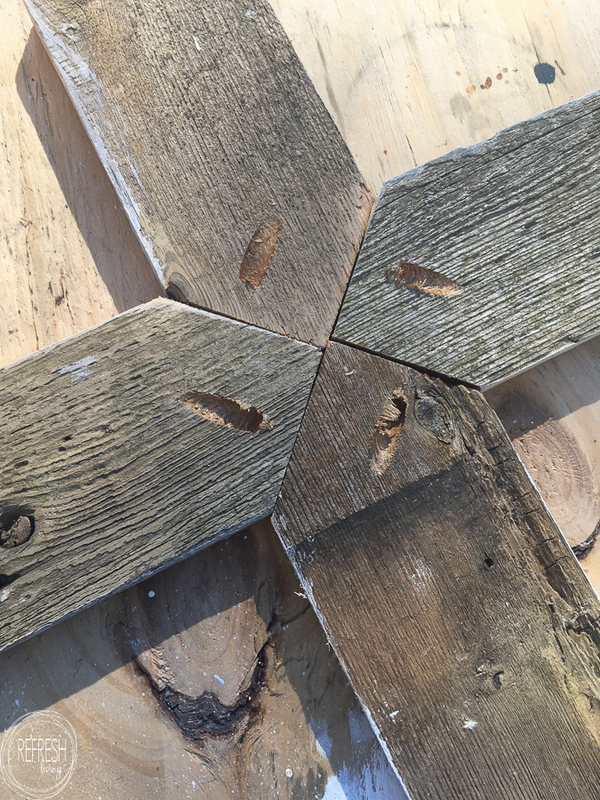 I used my Kreg Jig to connect all the pointed pieces together in the center. 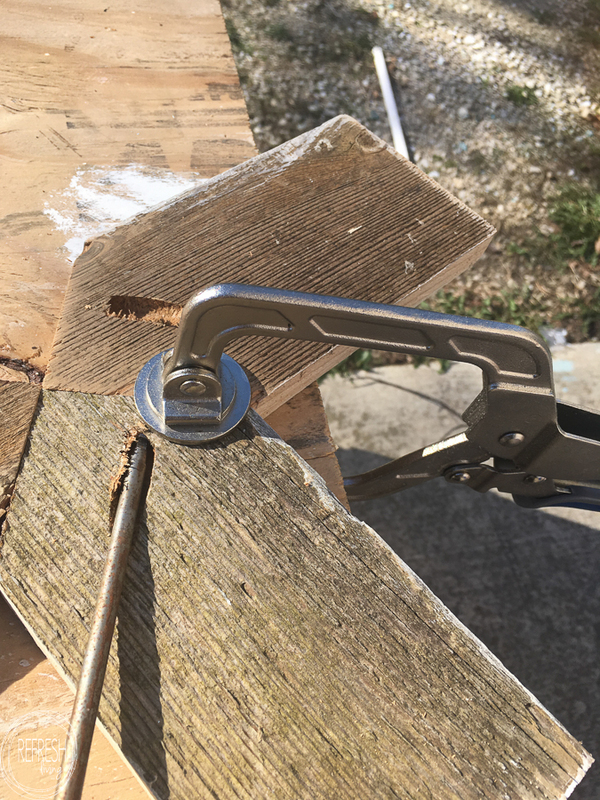 I LOVE using this tool to attach flat boards together to make a sign, to join together wood at right angles, or really anytime I need to create joints. It’s super easy to use, too! 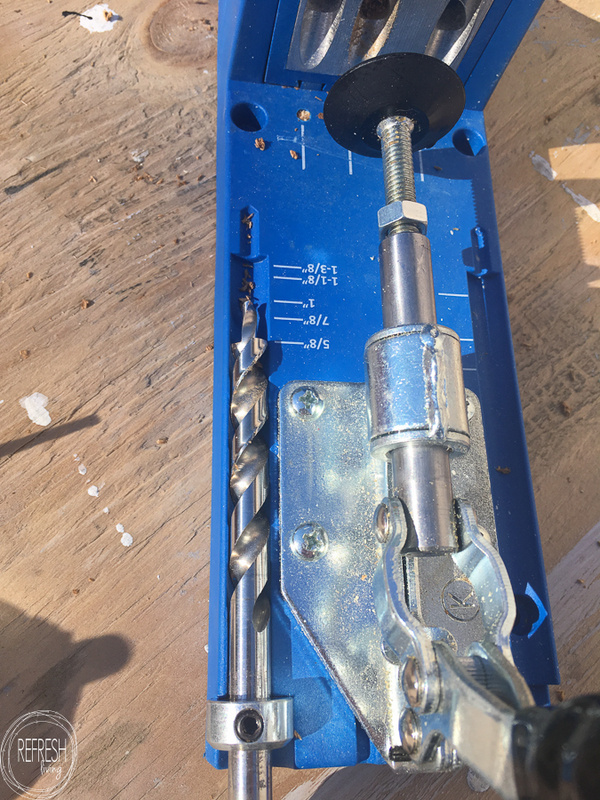 My wood was 5/8″ thick, so I set my drill bit to that length. Then I rested one of the cut sides onto the jig and drilled one hole into each of the boards. Here is a look at all the recessed holes ready for the screws. 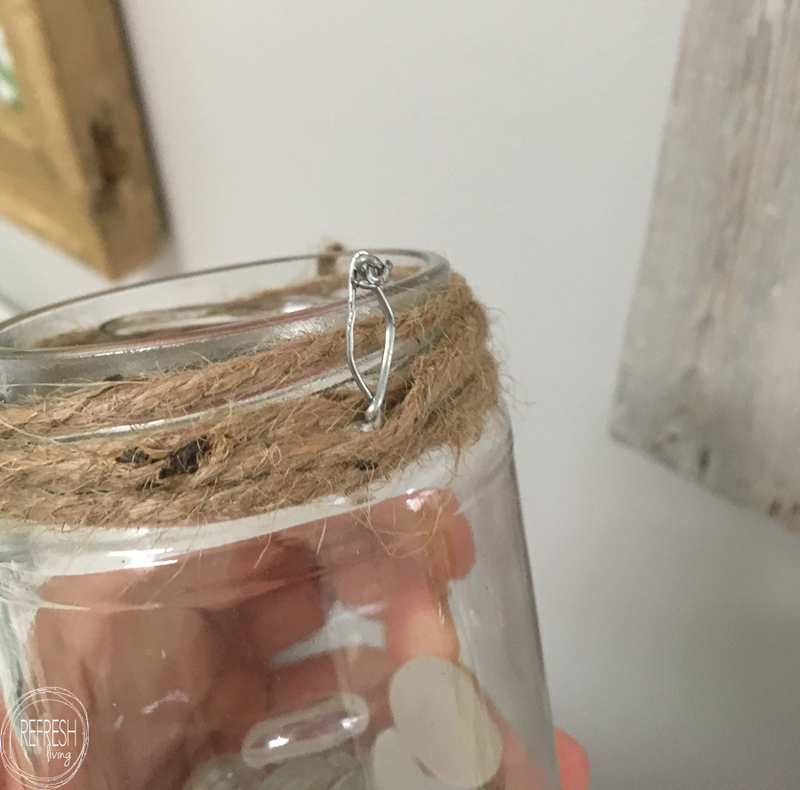 To hang the glass jar, I wrapped some 20 gauge wire around the neck of the jar, but underneath one of the screw rings so it doesn’t slip. On the back, I make a little loop with the wire for hanging. 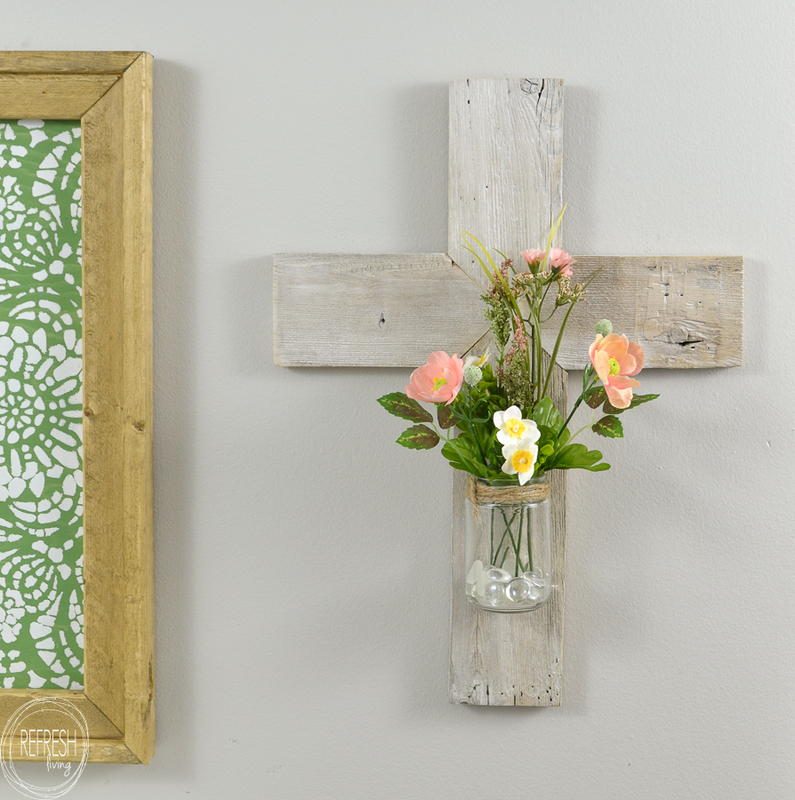 A picture hanging bracket is the perfect sized hook to hang up the glass jar. 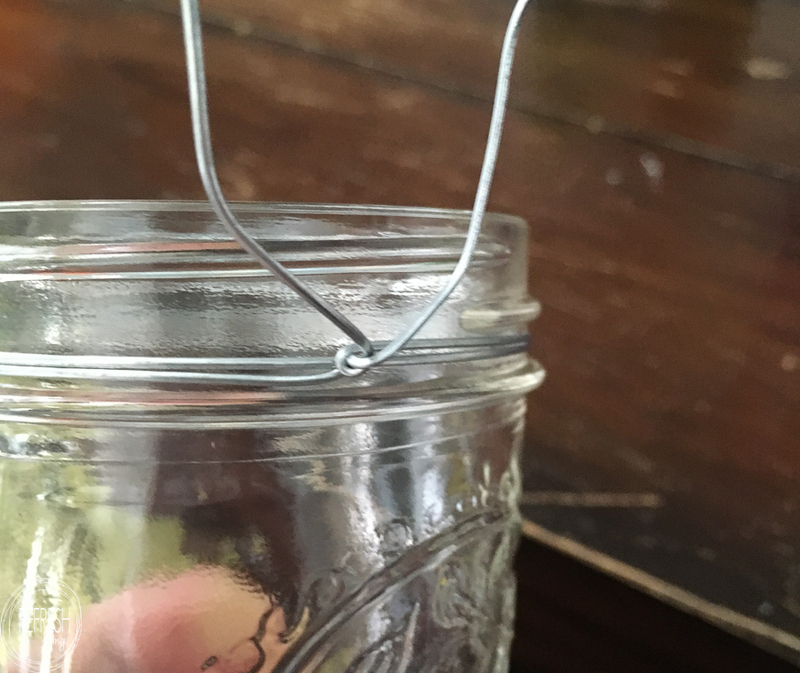 If you’re using an old glass food jar, you’ll want to check out the best and ONLY way I remove stuck-on labels from jars. 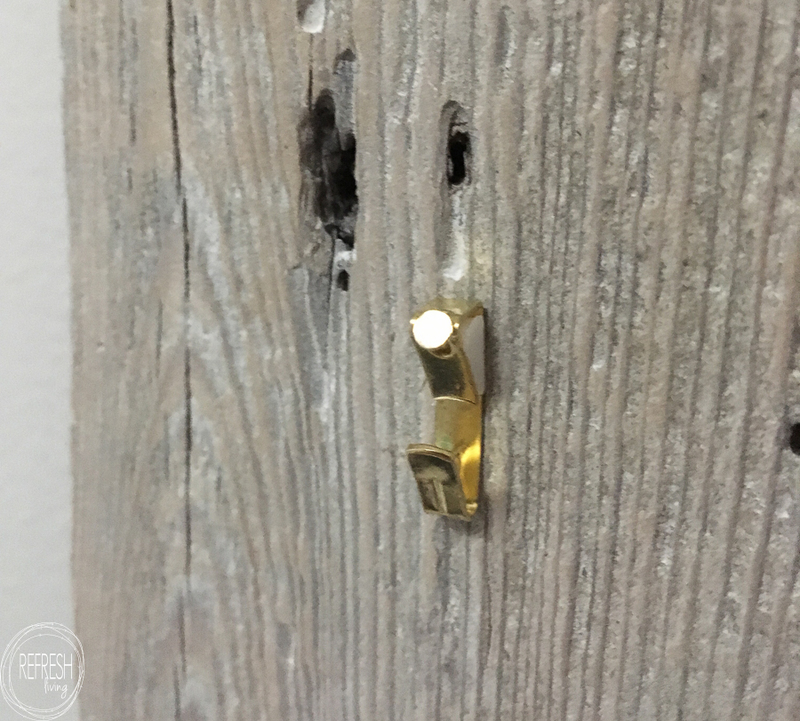 With the right tools, this project is so easy to put together!! 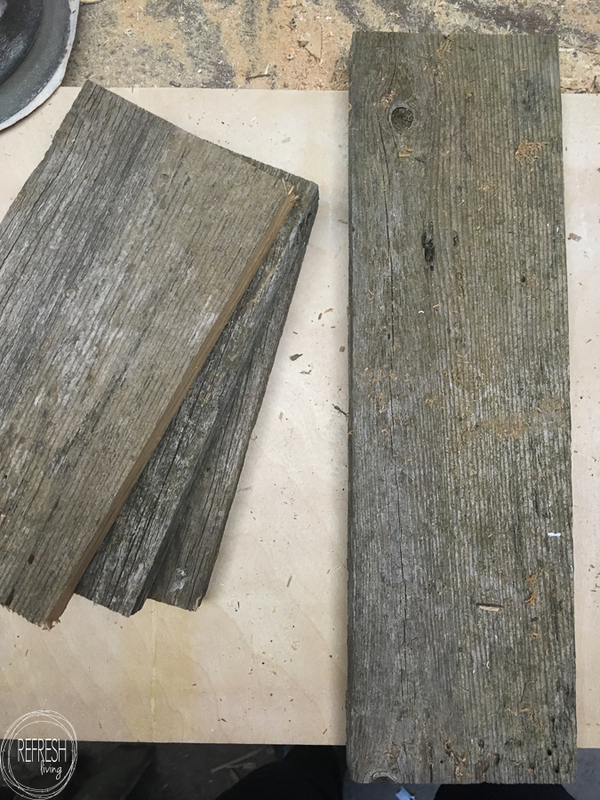 I personally think the character in this type of wood just can’t be matched by the imitation “rustic” pieces in stores. 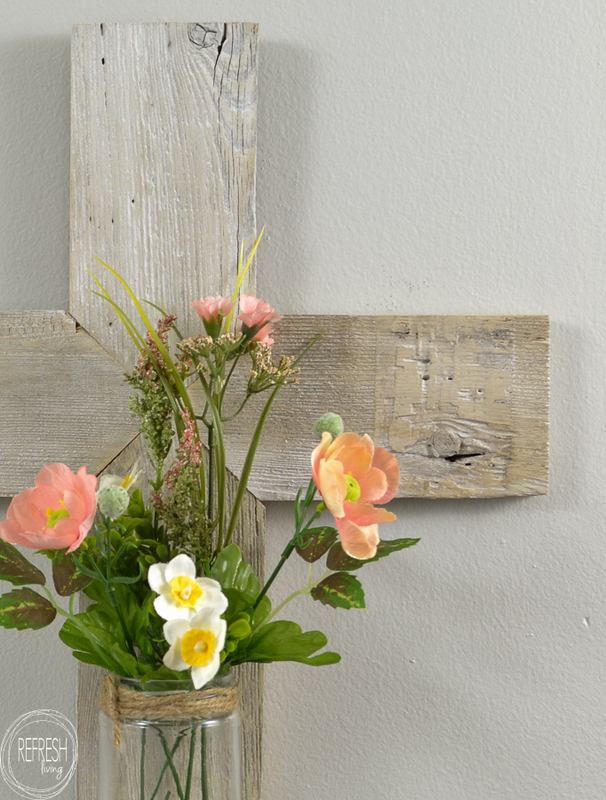 How beautiful for Easter and beyond. Love it! Sharing on G+ Thank you for sharing on Merry Monday! Hope to see ya next week! This is just gorgeous! 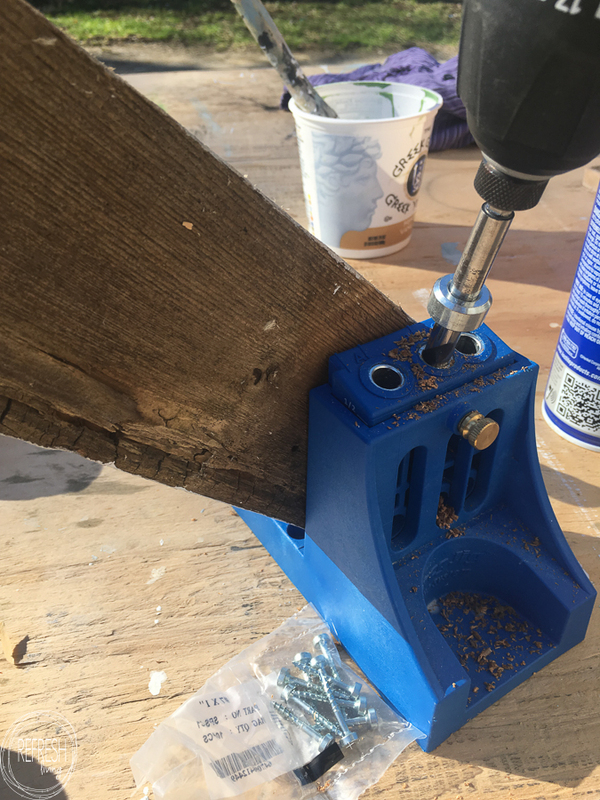 I have a kreg jig mini that I’ve used once…now I’m thinking that I should have invested in the one that comes with a guide. Great tutorial! This is so cute! Thanks for sharing at #HomeMattersParty! 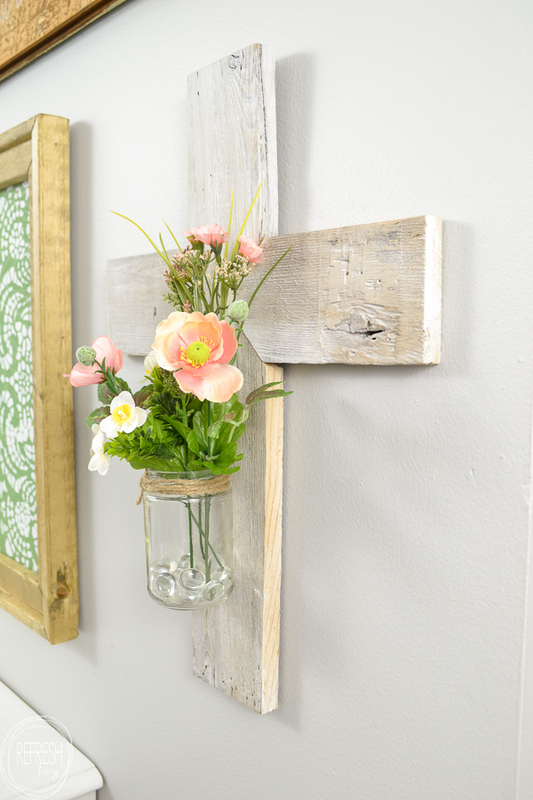 You cross is wonderful I love that you used the old picket fence. 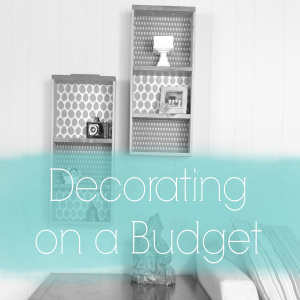 THanks so much for the feature, Karren!